A COMPROMISE IS defined as the settlement of differences reached by each side making concessions. This is an important definition to remember when you are trying to resolve a sensitive issue that is heightened by emotion and tangled with public perception. When you are the leader of a majority government, there is no need to compromise. However, if you truly believe in representing all Ontarians, you should be open to doing so. When it comes to the issue of pollinator health, we know Premier Kathleen Wynne is serious about imposing regulations that will reduce the use of neonicotinoid treated corn and soybean seeds in Ontario. 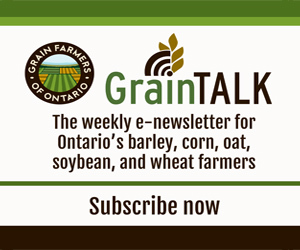 And, despite what many have assumed, Grain Farmers of Ontario is not fighting for the status quo. Last September, a Task Force was formed that included commercial beekeepers, farmers, and representatives from the agriculture industry. Originally, it also involved the provincial government. When they walked away, we remained at the table to develop a compromise that would work for everyone involved. This compromise is known as the Ontario Pollinator Health Blueprint (details of which can be read on page 18). It is a proposal we believe the government could have developed and would have developed if they had remained part of the collaborative process we engaged in instead of creating their own plan. Under our proposed Blueprint, farmers will need to make a significant commitment — but so will beekeepers. Each side has agreed that changes need to be made. No one argued for the status quo, but at the same time, no one argued for a win-lose situation. It may sound cliché, but this plan is a win-win. Instead of someone picking the winner through a flawed process, a fair and balanced solution was agreed upon in which each side could be satisfied with the results. I believe this process is one government should look to — not just when dealing with pollinator health — but for other issues as well. If you involve the people invested in the situation, they can come up with a solution that is workable for everyone and meets the desired goals. It is a better outcome than creating heavy handed regulations that can’t be properly implemented.